Before 1966, North Carolina’s courts operated under a system in which Superior Courts were uniform across the state, but lower courts were operated by cities and counties. The jurisdictions of these lower courts varied from place to place. During this time, prosecutors were known as solicitors. The state court system underwent reforms in the 1960s that resulted in a new unified, statewide court system. Legislation passed in 1965 reorganized the courts, and this new unified court system — the General Court of Justice — began operating in 1966. Eventually, solicitors’ offices were consolidated, creating a District Attorney’s Office in each judicial district. Some of these changes occurred during Solicitor Thomas F. Moore, Jr.’s term as Mecklenburg County’s chief prosecutor. Moore was elected as Solicitor in 1970 and took office in 1971 when he was 28 years old. As a result of the implementation of the unified court system, he became Mecklenburg County’s last Solicitor and the county’s first District Attorney. DA Moore served one term, leaving the District Attorney’s Office in 1974 to work in private practice and as general counsel for a local corporation. He became a District Court Judge in 2003. While in office, DA Moore hired Peter S. Gilchrist, III as a prosecutor. When DA Moore decided not to run for reelection in 1974, Gilchrist entered the race. Gilchrist won the election at the age of 35, and he became District Attorney on Jan. 1, 1975. He served as Mecklenburg County’s District Attorney for the next 36 years, running unopposed for reelection for each of his nine terms. Between 1975 and 2010, the number of prosecutors working under Gilchrist grew from approximately 14 to 80, and the number of support staff grew from two to 55, becoming the largest District Attorney’s Office in the state. Recognizing DA Gilchrist’s long service to the State of North Carolina, the North Carolina Bar Association named an annual award in his honor. The Bar Association’s Criminal Justice Section presents the Peter S. Gilchrist, III Award each year to an outstanding prosecutor. When DA Gilchrist announced his retirement, Andrew Murray declared his intent to run for the office of District Attorney. Murray had worked under DA Gilchrist as an Assistant District Attorney in the early 1990s before entering private practice. Murray won the 2010 election, and he took office on Jan. 1, 2011. DA Murray was reelected in 2014. In 2017, the President of the United States nominated Murray to become the U.S. Attorney for the Western District of North Carolina. The United States Senate confirmed the nomination, and in November 2017, Murray was sworn in as the region’s chief federal prosecutor. N.C. Governor Roy Cooper appointed Spencer B. Merriweather III to serve as interim District Attorney, filling Murray’s vacated seat. Merriweather had served as an Assistant District Attorney for more than a decade, prosecuting a variety of crimes such as drug trafficking, domestic violence, sexual assaults and homicides. Merriweather was sworn into office as Mecklenburg County’s District Attorney on November 27, 2017. Mecklenburg County’s first court session was held on Feb. 26, 1763, at the home of Thomas Spratt in Charlotte. The county’s first courthouse, a log building located at the intersection of Trade and Tryon streets, was built in 1768, and it operated as the county courthouse for 42 years. 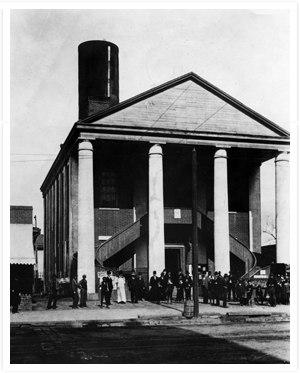 In 1810, the log courthouse was replaced by a brick courthouse, also located at the intersection of Trade and Tryon streets. Court was held there until 1845, when the county’s third courthouse was built near what is now West Trade and Church streets. 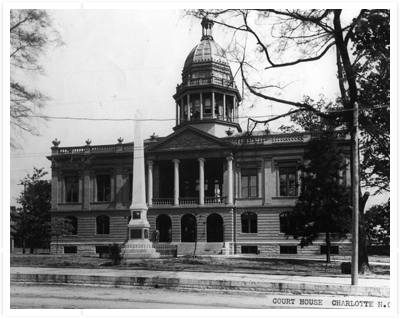 Construction of the county’s fourth courthouse began in 1896 on South Tryon Street at East 3rd Street. By the 1920s, Charlotte had become a textile center and North Carolina’s largest city. Economic success led to a building boom, and prominent Charlotteans began a push for a new courthouse that would reflect the city’s progress. The Board of County Commissioners voted in 1925 to build the new courthouse on East Trade Street. 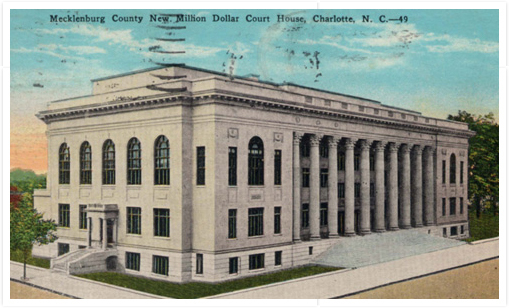 In March 1928, the county’s fifth courthouse was formally opened with a celebration that offered tours of the building, which had been deemed the “million-dollar temple of justice” by the Charlotte Observer. The Observer reported that thousands of people attended the formal opening and “every caller was anxious to visit” the rooftop jail, the most popular part of the tour. Known today as the Historic Courthouse, this building is Mecklenburg County’s oldest remaining courthouse, and it is designated as a historic landmark. The Historic Courthouse’s jail was in use until the 1960s, and empty jail cells still remain on the top two floors of the building. The Historic Courthouse served as the county’s main courthouse until the late 1970s. By the 1980s, court was no longer held in the building, and as the courtrooms and other court offices moved to a new courthouse across the street, space in the Historic Courthouse was gradually turned over to the District Attorney’s Office for use as office space. Today, the building is exclusively occupied by the District Attorney’s Office. A renovation project completed in 2012 highlighted the building’s original character while also creating much-needed space for the District Attorney’s staff. The county’s sixth courthouse was built in 1978 on East 4th Street, and then in 1989, that building was connected to a seventh courthouse. The eighth courthouse, which is Mecklenburg County’s current courthouse, was built in 2007 at the corner of McDowell and East 4th streets.